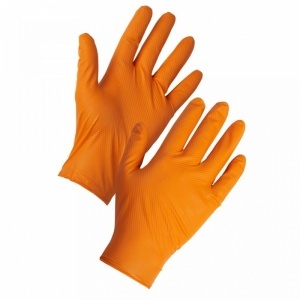 The Supertouch PG-901 Orange Disposable Nitrile Diamond Grip Gloves are disposable gloves made from heavy-duty nitrile for excellent durability and resistance to tear. 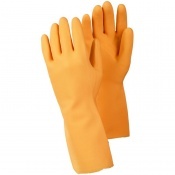 With a unique diamond-textured surface that provides outstanding grip in both dry and oily environments, good resistance to sodium hydroxide and resistant to permeation by micro-organisms, these gloves are ideal for a wide range of application, including various tasks in the agricultural, automotive, engineering, science, food and janitorial services industries. 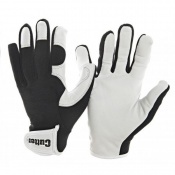 Sizes Small, Medium, and Large are supplied in dispensers of 100 gloves. Size Extra Large is supplied in a dispenser of 90 gloves. The PG901 Gloves are manufactured from heavy-duty nitrile for excellent durability and tear resistance. While strong and resilient, these gloves still have excellent stretch, promoting ease of movement and reduced hand fatigue. Featuring a unique diamond grip texture across the outer surface, the Diamond Grip Gloves allow for outstanding grip, even in greasy conditions. This promotes safer handling and reduces the force required to grip objects (particularly greasy parts). By decreasing the amount of force needed to maintain grip, this diamond texture prevents hand and arm fatigue. Please note that these gloves are supplied in two different quantities: sizes Small, Medium and Large are sold in dispensers containing 100 gloves each, while size Extra Large is supplied in a dispenser of 90 gloves.